PENNYWEIGHTS STARTS WITH THE LETTER D - RIGHT? If you are like me – you are curious. I often looked at the abbreviation for pennyweight, namely “dwt,” and wondered why it was not “pwt.” To understand this seemingly illogical abbreviation, one must look back through history. The abbreviation “dwt” begins with Roman coinage. 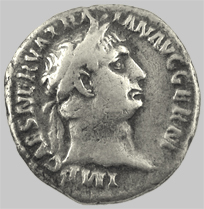 The denarius, a Roman silver coin, was used in England until the Romans retreated in 411 A.D. Thus, the “d” in “dwt” is from denarius and the “wt” is for weight. Even after the Romans left England, coins were minted imitating Roman coins. Eventually, the issuance of coins in England improved. For example, a Frankish King called Pepin the Short minted silver pennies that weighed approximately 20 grams and had the same diameterPennyweight. This was the standard for the next 500 years. By the way, the English word “deniers1” was from the Latin “denarius” through the French language. ← A silver Roman Denarius depicting the emperor Trajan circa 98 - 118 A.D. Some time in the 10th century the English penny’s weight increased to 22.5 grams. You may be wondering how a pennyweight which weighs 24 grams can be derived from a 22.5 gram penny. Some sources claim that original English pennies may have weighed 24 grams but the mint charged a percentage for their profit, called “seignorage.2” That would account for the slight difference in weight if the seignorage was taken directly off the coins. In researching the abbreviation "dwt" I discovered that it is, according to all major dictionaries, quite acceptable to use the abbreviation "pwt." I have illustrated here an early American gold weight that is marked with "pwt" that is part of a gold scale made circa 1810. 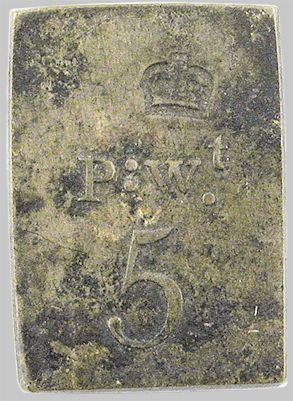 ← Early American 5 pennyweight weight circa 1810. The American cent, also called a penny, does not weigh 24 grams. The older ones, up to 1981 weighed 3.11 grams. The newer ones, made of zinc with copper plating, weigh a mere 2.50 grams. I remember when you could use 10 American pennies to roughly determine what an ounce weighed. This was especially useful whenever you did not have a scale handy. With today's pennies, you will need to heft 12.44 pennies to achieve the same estimate.